Create and track employee records in your personalized HR database, such as personal data, benefits, contact information, documents, and much more. Utilize our built-in features such as Asset Management, Incident Tracking, and Succession Planning to gain the full CommonOffice experience. Submit your requests and see in real-time how your system sorts your information into categories and shows it in graphs. Automatically track the hours of your employees so that they can be reimbursed for their hard work. Be able to track employee reviews and organizational goals so you can see their development with the company. Stay connected with multilingual capabilities and mobile apps so you can manage your HR from anywhere. 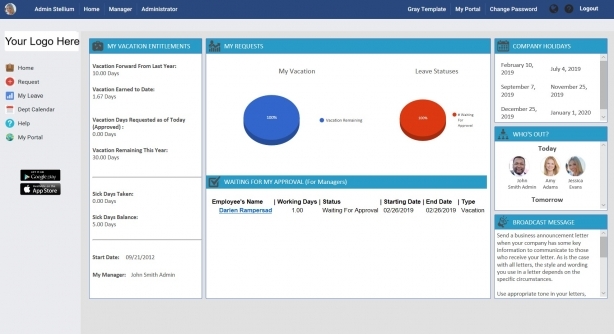 Have your HR Software look and feel the way you have always imaged. Fully compliant with your organization and government regulations, and loaded with important documents. Tired of HR Software that reminds you of work? CommonOffice has created a social HR platform where you can communicate directly with your employees and provide them with all the tools they need to succeed.